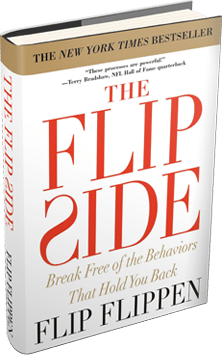 Hi, I’m Flip Flippen, author of the New York Times best seller, The Flip Side. There are two films that I’ve gotten great lessons from, and I want to tell you the two lessons that I’ve learned. Now there’s another side to this too, and that one is from the movie, A Christmas Carol. My favorite character in the whole deal is Scrooge! I know that might surprise you, but I just love it, because I’ve found that every family would tend to have a Scrooge in their family. Sometimes they even have several of them. It seems like they clone themselves, somehow. It’s contagious! But I’ve learned how to deal with Scrooges, too. For us it’s not that bad – we just continue to smile. We have fun! Every time they say something negative, we come back with three or four positive things. We laugh about it! If they say something negative, even if they mean it in kind of a malicious way, we’ve just agreed as a family we’re going to laugh about that. You know the worst thing that can happen with that is they get offended and leave early! Whoa! That’s not such a bad thing! We have this great attitude and atmosphere in our home. OK, so just to recap what we talked about – my two favorite films: It’s A Wonderful Life – “No man’s a failure if he has friends.” You guys have got friends – be a friend! And then the second one is Scrooge from A Christmas Carol. And the whole thing there, is that everybody’s got one of those in their family. Love them, love them, love them! Hopefully there will be this miraculous transformation, but the good news is, at the very worst it still comes to an end and they go home. So you win either way!! !